The Faith and Ecumenical Discussion Group holds an informative conference call on the first Sunday evening of the month at 7:30, hosted by co-coordinators Brian Talcott and Marilyn McPherson. We share our questions and experiences and learn of new activities happening in various ecumenical and interfaith groups in the area. 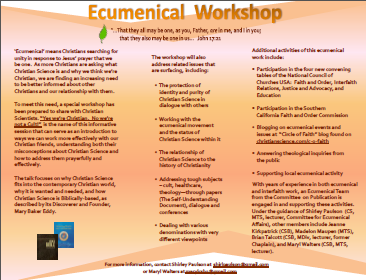 An important development is the launching this year of an Ecumenical Workshop for Christian Scientists from the Manager of Committees on Publication. The conference calls are open to all. Next call: Sunday, Feb. 2, 7:30 p.m.
Dial-in Number: (661) 673-8600; Participant Access Code: 327950#.